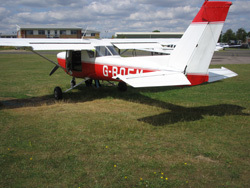 Click on the image of G-BOFM Cessna 152 to see pictures of my first flying lesson and also to see the Pilot's Log om journey into the unknown when I first learnt to fly! There is also a great certificate to view when I flew my first solo flight! 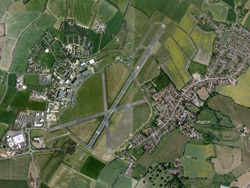 Click on the image left to view some of the airfields we have visited with a short description of what was discovered there and any interesting facts that may be of interest to aviators. I will post new airfields as and when they are visited. They are not in any particular order, but I have tried to place them in the order I visited them during my training and also following my successful PPL test. 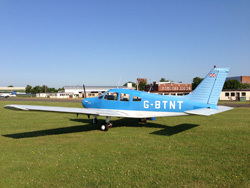 Click on the great photgrpah on the left of the Piper Arrow G-AVWU to see some fabulous photographs of the aeroplanes that mean a great deal to me! 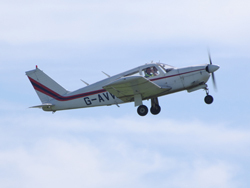 The picture on the left was taken by David Gearing when we had a great trip to Kemble Aerodrome. He was kind enough to send me numerous images which populate the page you will see! Click on the photograph on the left to see what I have lined up as latest adventures and new aerodromes I may visit!